Neide Fátima Cordeiro Diniz Oliveira1, Renata Cristina Cordeiro Diniz Oliveira2. Introduction: Both congenital and acquired syphilis may cause cochleovestibular dysfunction. In the literature, the neurosensorial hearing loss, tinnitus and unbalance have been described in the secondary and tertiary syphilis. Objective: The objective of this work was to emphasize the need for etiologic identification for treatment and control of individuals with cochleovestibular symptoms. Case Report: We described the case of a patient, aged 64 years, black, with complaints of slow and progressive diminishing of auditory accuracy since about 12 years ago, associated with tinnitus and occasional unbalances. In the laboratorial and audiometric evaluation, after exclusion of other related causes, we came to the additional diagnosis of otosyphilis. Final Comments: Syphilis must always be taken into account in patients with cochleovestibular complications, irrespectively of the age range, whether or not belonging to risk groups, and the number of partners of each patient. The etiological diagnosis is very important for the control and treatment of such patients. Syphilis is a multisystemic disease caused by the Treponema pallidum ssp. that may affect the inner ear (3, 4). Despite having been almost eradicated after the penicillin age, its incidence has been increasing in the last 15 years in Europe, Russia, United States and Canada, specially among homosexuals and bisexuals, intravenous drugs users and patients with HIV positive and hepatitis B and C (3, 4, 5). Studies reveal that both the congenital and the acquired forms may cause cochleovestibular dysfunction. The incidence of hypacusis in the primary syphilis is of 17%, of 25% in the secondary and 54% in the tertiary or neurosyphilis (6). In the affected adults, the mostly found anatomopathological discoveries are mononuclear leukocytes infiltrates, obliterating endarteritis and endolymphatic hydrops. In the congenital form, the malformation of the endolymphatic duct and sac and the semicircular canals has been observed (3, 4, 5). In spite of these findings, the ultimate diagnosis of otosyphilis is not often confirmed by the presence of the treponema in the inner ear fluid and/or the histological exam of the temporal bone. The occurrence of otosyphilis in the primary and secondary stages reinforces the hypothesis that the primary vascular affection may be the cause of the symptoms (5). The basic diagnostic tests include VDRL and FTA Abs (5). The cerebrospinal fluid study has been carried out preferably in the patients with clinical suspicion of recent neurosyphilis, that is, sudden visual and auditory loss and for long term treatment effectiveness control because the treponema grows slowly in the late stages of the affection (6, 7). Therefore, its diagnosis is usually based on the positive results of the serology of patients with cochleovestibular symptoms, without other related causes (3, 4, 5, 6). The rarity of the case, the patients' age range and the form of clinical manifestation of syphilis were relevant issues that encouraged the case description. This study reports the case of a patient with otosyphilis. CVS, a 64-year old female, black patient, born in Santa Maria de Suaçuí (MG), living in Belo Horizonte sought the otorhinolaryngological service at the Medical Sciences School of Unifenas-Campus BH, with complaints of bilateral hypacusis slowly progressive, tinnitus and intermittent unbalance for about 12 years. She worked as road sweeper in the urban cleaning service for 10 years. She regularly used Captopril 75mg/day, Tiroxin Sodium Salt 50mg/day and Simvastatin 10mg/day. The otorhinolaryngological physical exam and the static and dynamic balance researches were normal and no spontaneous or semi-spontaneous nystagmus was detected. The tonal audiometry (Figure 1) showed bilateral neurosensorial dysacusis. The laboratorial exams, including blood count, glucose, cholesterol, triglycerides, TSH and HIV serology were normal. The FTA-Abs IgG was positive and the VDRL = 1/64. The Nuclear magnetic resonance (MNR) of brain and temporal bones showed a light diffuse volumetric reduction of the brain and absence of other significant abnormalities. The patient was sent to the infectologist for treatment and was using benzathine penicillin. 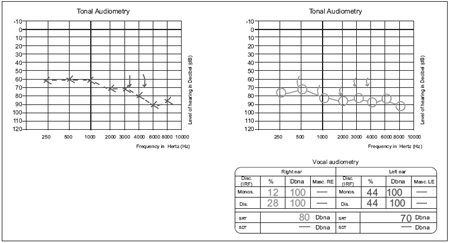 Six months after treatment a new tonal audiometry was carried out and showed an audiometric improvement from 10 to 20 dB and of the vocal discrimination. The patient reported the tinnitus and the unbalances disappeared. We then forwarded her for hearing aid fitting. The otosyphilis symptoms are basically resulting from the cochleovestibular commitment, and hypacusis, tinnitus and unbalances are the most common forms of their manifestation (3, 4). The diagnosis of otosyphilis was based on the VDRL and FTA Abs results and the audiometric discoveries (3, 4, 5, 6, 7). In the case of the patient, the affection duration was unknown and she had relationships with two partners during her whole life. Previous studies suggest the neurosensorial hearing loss, whether symmetric or not, unilateral or bilateral, generally progressive, is the most common manifestation, there is no specific audiometric hearing loss pattern and the vocal discrimination may be compatible or not with such loss (8, 9, 10). Other symptoms may occur such as unbalance and auricular plenitude (3, 4). The symptoms duration may vary from days up to 20 years or more, since the T. pallidum has a reduced growth rate during the ultimate stages of the syphilis. The treatment using penicillin G, and sometimes steroids, along with periodic cure controls, are the mostly recommended (10, 11). Today, some authors reveal the evidences suggest that the patients with VDRL>1:32 or positive HIV with CD4>350X10/L have a higher risk of commitment of the central nervous system, and benefit from the cephaloraquidian liquid exam even without symptoms (9, 10). Both the computed tomography and the nuclear magnetic resonance of the brain are useful in the follow up and evolution of the patients, when detecting possible lesions of the inner auditory meatus, meningeal commitment, cerebral parenchymatous lesions and/or vascular infarctions that would suggest a concomitant diagnosis of neurosyphilis and/or other diseases of the inner ear (11, 12). Syphilis must always be taken into account in patients with cochleovestibular complications, irrespectively of the age range, whether or not belonging to risk groups, and the number of partners of each patient. The etiological diagnosis is very important for the control and treatment of such patients. 1. Politzer A. Lehrbuch der Ohrenheilkunde fur Praktische Arzte und Studierende. Ferdinand Enke-Verlag, Stuttgart, 1887. 2. Gradenigo G. Krankheiten des Labyrinthes Und des Nervus Acustius. In: Schwartze H, ed. Handbuch Ohrenheilkunde, Leipsg, Verlag FCW Vogel. 1893:352-354. 3. Brown TJ, Yen-Moore A, Tyring S K. An Overview of Sexually Transmited Diseases. Part I. J Am Acad Dermatol. 1999, 41:511-532. 4. Klemm E, Wollina U. Otosyphilis: Report on Six Cases. J Eur Acad Dermatol Venereol. 2004, 18(4):429-34. 5. Sando I, Orita Y, Miura M, Balaban CD. Vestibular Abnormalities in Congenital Disorders. Ann NY Acad Sci. 2001, 942:15-24. 6. Mishra S, Walmsley SL, Loutfy MR, Kaul R, Logue KJ, Gold WL. Otosyphilis in HIV- coinfected Individuals. A Case Series from Toronto, Canada. AIDS Patient Care STDS. 2008, 22(3):213-9. 7. European Guideline on the Manegement of Syphilis, 2008. 8. Yimtae K, Srirompotong S, Lertsukprasert K, Kaen K. Otosyphilis: A review of 85 cases. Otolaryngology-Head and Neck Surgery, 2007, 136, 67-71. 9. Young H, Syphilis. Serol Dermatol Clin. 1998, 16:691-698. 10. Marra CM, Maxwell CL, Smith SL, et al. Cerebrospinal Fluid Abnormalities in Patients with Syphilis; Association with Clinical and Laboratory Features. J Infect Dis. 2004, 189:369-376. 11. Petzold D, Jappe U, Hartmanm M, Hamouda O. Sexually Transmitted Diseases in Germany. Int J Std AIDS. 2002, 13:246-254. 12. Yimtae K, Srirompotong S, Lertsukprasert K. Otolayngol Head Neck Surg. 2007, 1369(1):67-71. 1. Master's Degree in Health Sciences/UFMG. Clinical Director at Otomed and Preceptor of the 11th and 12th periods of the Medical Students UNIFENAS/BH/MG. 2. Medical Student at the Medical School of Barbacena, FAME - MG.
Institution: Medical Sciences School UNIFENAS. Itajubá / MG - Brazil. Mail Address: Renata Cristina Cordeiro Diniz Oliveira - Rua Ascânio Bulamarque, 199 - Mangabeiras - Belo Horizonte / MG - Brazil - Zip Code: 30315-030 - Fax: (+55 31) 3273-2000 - E-mail: dinizrenata@yahoo.com.br. Article received on November 2 2008. Approved on March 19 2009.